After a day in the sun, the whole family showers up and heads out to dinner. And little ladies can feel dolled up while still keeping it casual with Reef Girl's Youth Little Cushon Sassy Sandals. Stylish reptile embossed faux leather straps with dusted glitter and soft satin lining make these stylish and comfortable sandasls. After a day in the sun, the whole family showers up and heads out to dinner. And little ladies can feel dolled up while still keeping it casual with Reef Girl&apos;s Youth Little Cushon Sassy Sandals. Stylish reptile embossed faux leather straps with dusted glitter and soft satin lining make these stylish and comfortable sandasls. 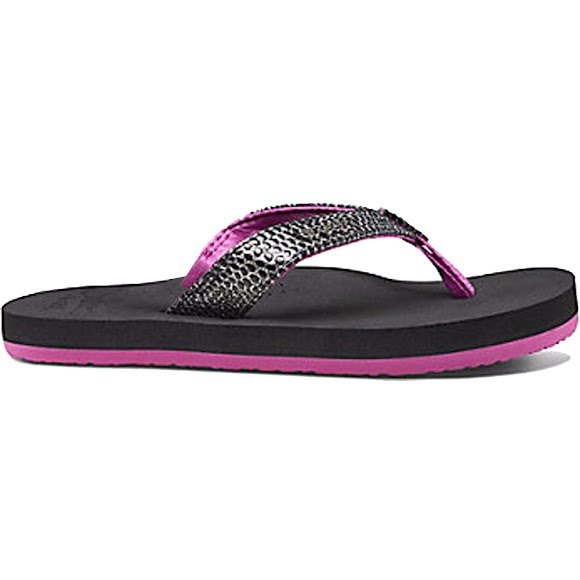 These girl&apos;s sandals also have soft EVA footbeds that provide superior comfort with durable rubber outsoles.